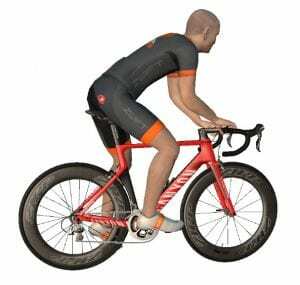 Zwift’s Drop Shop release brought a pile of new frames and wheelsets into Zwift, and it also modified the specs on some existing equipment. Therefore, this post is now outdated. We’re keeping it here for reference and nostalgia, but if you want current data on the fastest bike frames, read Speed Tests: Zwift’s 9 Fastest* Bike Frames. The bike frame you choose in Zwift affects your speed, and your wheelset affects it even more. (See our test lap data to learn how specific frames, wheelsets, watts, and rider weight and height effect your times.) The five bikes below finish within 16 seconds of each other over a lap on the Watopia Figure 8 route at 225 watts with a 75kg, 183cm rider. While the four fastest bikes are high-level unlocks which take months of work to achieve, newbies can take heart: the Zwift Aero is quite slippery and can be unlocked with just a few weeks of riding. Lap times given are for one lap of the Watopia Figure 8 route at a constant 225 watts with a rider weight of 75kg and height of 183cm (6′), using the Zipp 808 wheelset (level 10 unlock). The Zipp 808 is consistently the fastest wheelset in Zwift. The fastest wheelset is the 808/Disc combo, but this was only available to early beta testers so we do not include it in our tests. If you have this wheelset, your fastest racing setup would be the Cervelo S5 + 808/Disc, since the Tron bike does not allow you to change wheelsets. The TT bike consistently turns in the fastest solo lap times of any bike. 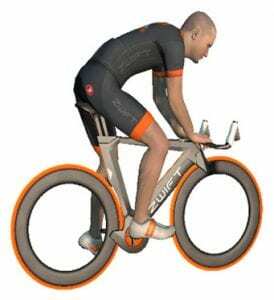 But since the TT bike cannot draft and is disallowed in most races we did not include it in the list. Any idea about whether S5+808/disc is faster? My guess is it would be, yes. But since the vast majority of Zwifters don’t have access to the 808/disc wheelset I didn’t factor it into the list above. Is there a comparison of ALL bikes and wheel sets available on ZWIFT? Does it now draft ? I found early doors it didn’t.. making group rides tricky so didn’t use it. It has always drafted, it just didn’t look like it because they didn’t program the avatars to sit up like they do on other bikes. Thanks for the post. With regards to the Tron bike – anecdotally a few people have said it doesn’t ‘feel’ as quick in a bunch. Have you done any comparison tests at all? I suspect the latest Buffalo to be the fastest now… with the 808/Disc or 808 wheelset. But the Buffalo isn’t available in game now that WBR is past, right? Well – I still have it in my bikes list… maybe it was ‘unlocked’ during last year WBR events? hard to tell actually. Not at this time. But they’ve got a lot of new bikes on the way! I clicked on the “details” link for the Tron bike, and the first step says “Select the Everest Challenge.” Right there you lost me. I’ve never seen that as an option. Where do I find it? You are automatically entered into the everesting challenge. 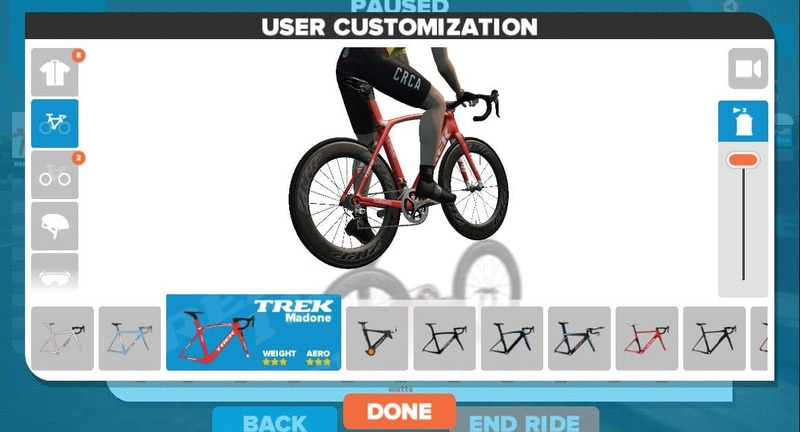 Once riding (or stopped having selected riding) click the screen, menu button appears bottom left, click menu button, your profile is displayed with mid right image of Mount Everest, click image to see your progress). You are most certainly not automatically entered. You have to select the challenges. glad to hear the Tron bike really is faster, rather than just feels faster. Reading that it wasn’t that fast a bike after all that work was a bit disappointing. Best part about it is it makes it easy to pick out of a crowd when you are in a group. The linked article you wrote earlier this year on how to obtain the Tron bike states that one must complete the Everest Challenge + 41,150 meters. This one states Everest Challenge + 50,000 meters. Which is currently correct? 50,000 meters total is correct. Thanks for the heads up, I corrected it! I earned the Tron Concept bike a few days ago. When riding it and I’m in a drafting position my Avatar does not sit up to indicate a draft benefit. In fact i don’t recall getting the “close the gap” countdown either. Have not ridden it enough to know if it’s like the TT bike with no draft. Have not read anywhere that that is the case. Can you please tell me how the TT bike compares to the bikes on this list? Those are just comparison times for those bike on the figure 8, not the way to unlock them. I believe they are unlocked by reaching levels. I just unlocked the Pinarello F8 today. How does it compare with the Zwift Aero? Finally unlocked the level 24 Cervelo! That’ll save me seven seconds a lap, haha. Still got a loooong way to go before the Tron is in my hands. Radio tower repeats anyone? 1. For basic “leveling” and training (i.e. not racing or group rides), is the TT bike the fastest overall? In workout mode, you can’t draft anyway, so it’d be nice to at least get as far as possible so that I can complete that darn California challenge! 2. Are these still the 5 fastest bikes? You DO draft in workouts. I would just ride the fastest bike I’ve got (non TT) for workouts, since you end up drafting quite a bit in workouts anyway. Yes, these are still the fastest bikes–retested them back in November. Wait, seriously? You draft in workout mode? You just don’t get the “get closer” message when you’re in the draft zone behind another rider? Correct. No message, but the drafting still happens. You can see it happening when you ride–I often get stuck behind someone when doing a workout. well doggone, that’s some great information! If I can get a few more miles during my training, that only helps me level up faster and get that California challenge done faster. Thanks! I’m pretty sure I read that you give draft to others in workout mode but do not draft yourself (maybe not to annoy others). I don’t think so… I definitely stick behind folks and draft when doing workouts, just like a normal free ride. “While you’re in workout mode, you’ll notice some differences from how Zwift works when you normally ride. You can’t draft (but others can draft you). ok, this does make sense then. TT bike and 808s while in workout mode! Actually it doesn’t. Your rider score XP increases based on workout intensity and successful intervals instead of distance. Ok these are fast but What When climing the radio tower? Surley emonda Or tarmac with f e 202 Will be faster no? Is there a difference in wheel sets for climbing or is the 808 still the best? For some events, where the frame is fixed (e.g. the monthly Fondo), you can mix the Tron wheel set with the event’s frame. Do you know how the Tron wheelset compares with the others? I have! The 808’s are still significantly faster on the flats. So it’s a “climbing only” wheelset. thanks Eric, preciate the response. Eric, I noted some weight changes in some of the bikes. For example the S5 now double what it was originally. Would be good to understand whether the bike weights still affect speed. Thanks for asking. I just did a test with the S5… but it was the same speed as my earlier tests. Can you run a similar test on climbing? just curious what bike & wheel combo works best, but also how much penalty am I taking for using the zwift aero with 808s over some lighter bike? Someone mentioned in another forum that the Tron bike seemed to have more difficulty than other bikes catching a draft, or staying in a draft. If this is true, than maybe the Cervelo is better for racing? Thanks for all the data crunching Eric. Fastest wheelset with my Zwift TT bike? Hi, is there significant differences between bikes while drafting also ? I mean will I need to put out more watts with the emonda than with the tron bike if i’m drafting in a group ? Working on testing them. Article will be out next week.